Alexandria Ocasio-Cortez, the Democratic Congressional candidate from New York, hit the scene a few months ago and quickly became the face of the future of the Democratic Party. Her socialist positions made her popular with Bernie Sanders and other of the like. After all, she is a member of the Democratic Socialists of America. On Saturday, Ocasio-Cortez celebrated her birthday in an odd way: by bragging about her "accomplishments" and the life she's built over the last seven years. Thank you to everyone that has worked to fill our community with love. Looking forward to the future we make. ? • When she was five she moved from the Bronox to Yorktown Heights, where the average household income is $141,254. • She attended Boston University, a private college where tuition alone currently sits at $52,816 (and no, that doesn't include room and board, books, fees, etc). • While in college she interned for U.S. Senator Ted Kennedy and handled foreign affairs and immigration casework for his constituents. • She campaigned for Bernie Sanders in 2016. • After the 2016 election she drove across the country to talk to people in Flint, Michigan about the water crisis there and to the Dakota Access Pipeline protests to talk with protestors. • She worked for the National Hispanic Institute, a nonprofit organization that fights for the civil rights of hispanics, as the Educational Director of the 2017 Northeast Collegiate World Series. Does Ocasio-Cortez sound like someone who can relate to the average Joe? Absolutely not. Does she know what it's like to have to work multiple jobs while attending college? Nope. Is she a political outsider? Hardly. 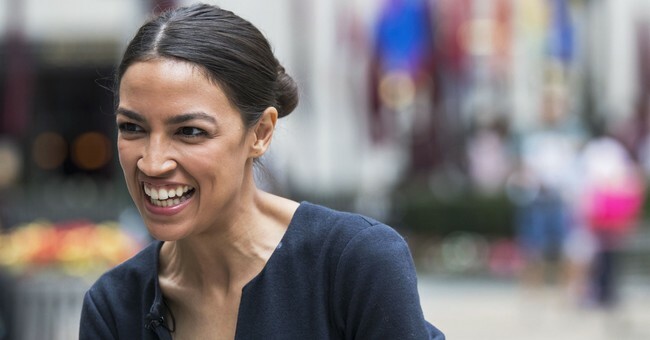 Why are Democrats falling for this Socialist darling? Oh, that's right. Because she's promising them "free" things.